A border crossing in the U.S. will be subject to the authority exercised through the Department of Homeland Security, a U.S. governmental federal agency, through various administrative and enforcement divisions. Accordingly, a border crossing which occurs in the manner generally meant by this terminology, which is to say illegally, will accordingly come under the coverage of the U.S. Border Patrol, as is tasked with preventing such occurrences. If the particular instance of an unlawful border crossing occurs with success, then the illegally resident immigrant to the U.S. can then become subject to the effort of deportation proceedings transacted by the United States Citizenship and Immigration Services (USCIS). Both the U.S. Border Patrol and the USCIS formerly carried out administrative and enforcement measures toward allowable and illegal border crossings in the context of the overall administrative framework of the Immigration and Naturalization Services (INS). As of 2001, the bureaucratic context for the regulation and prevention of border crossings was altered along with the nation’s overall shift toward a strengthened focus on the issue of national security, as provoked the shifting of both agencies into the newly created Department of Homeland Security, and the simultaneous closure of the INS as an effective sector within the U.S. government. The locations in which border crossings might potentially occur into the legal and political jurisdiction of the United States without the involved authorization of the federal government can be noted as comprising some 6000 miles, also noted as comprising 9700 km, worth of border shared by the nation with Canada and Mexico. Moreover, border crossings occurring in a way other than over land could also occur through border crossings over U.S.-maintained boundary waters. Toward this aspect of border crossing prevention and border patrol, the U.S. Border Patrol has been vouchsafed with the ability to guard against border crossings of some 2000 miles’ worth of water along the coasts of the Florida Peninsula and around Puerto Rico. The high border crossing rate currently known to be in effect for the legal jurisdiction of the U.S. has operated to make effective and wide-reaching legislation toward generally addressing the issue difficult to achieve in the current context of the U.S. Congress. Accordingly, the U.S. Border Patrol has been affected in the functions which it is allowed to exercise through the passage of the 1986 Immigration Reform and Control Act. This law was intended to stem border crossings specifically from the area of Mexico and without the coverage of legally furnished permission toward cutting back on the U.S. employee-provided incentive for such border crossings. Economic and social conditions prevailing in both nations have combined, however, to ensure a continued high rate for illegal border crossings and subsequent part played by such migrants in the U.S. labor market despite pertinent legislation and law enforcement measures undertaken. Border crossings have accordingly provided for political controversy in the United States. 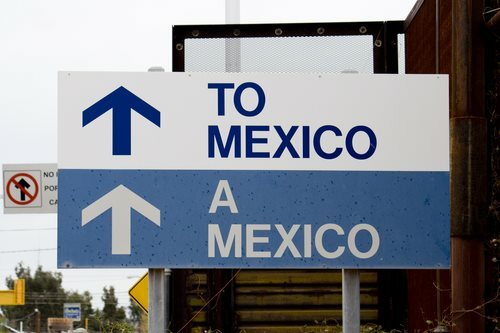 How To Cross US Border?